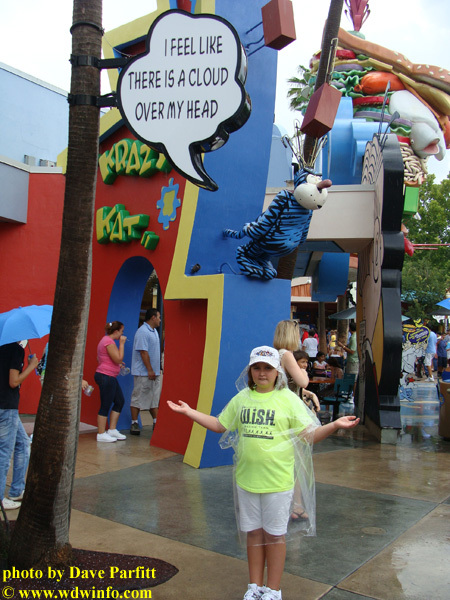 When planning our 2010 family summer vacation there was no question where we were headed. My girls, Maggie (age 12) and Evie (age 9), are huge Harry Potter fans. 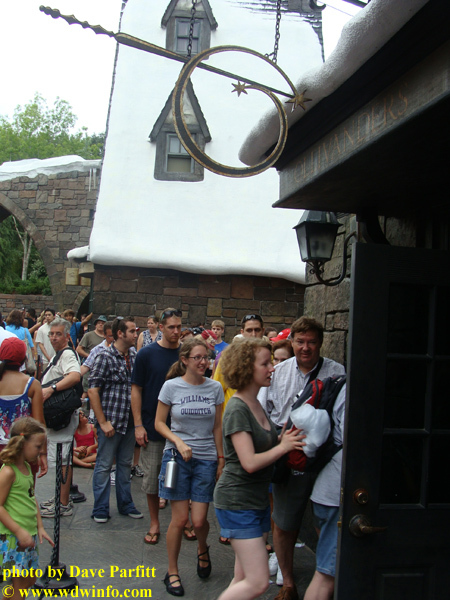 When they heard about the Wizarding World of Harry Potter opening at Universal Orlando’s Islands of Adventure, they begged and pleaded to go. We knew it would be hot and crowded this first summer, but were totally unprepared for the crushing mass of humanity we found. 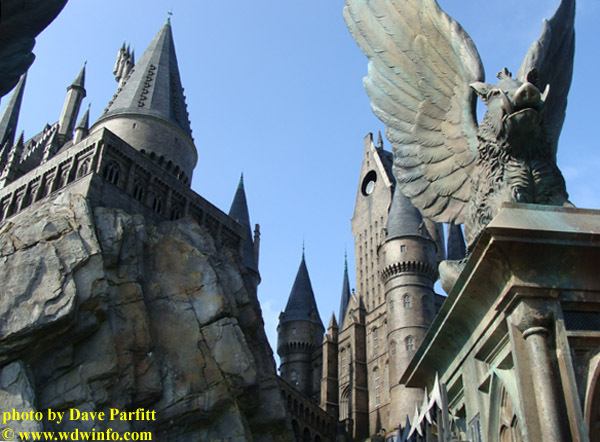 Continue after the break for our Muggle perspective of a not so magical experience. Those wanting the quick, take-home message, here’s the short and sweet version. The new land is incredibly well themed, meticulously detailed, faithful to J.K. Rowling’s vision of Harry Potter’s world (particularly as depicted on film), and stunningly gorgeous. However, the crowd level stuffed into this small area so negatively impacted our experience, we were left with an overall bad impression. 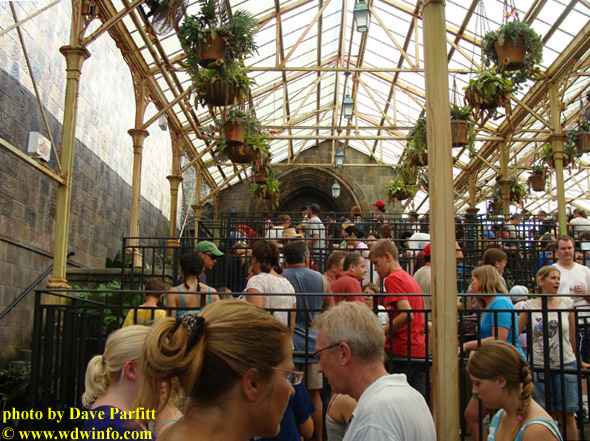 My wife summed it up saying she would not recommend anyone go to the Wizarding World of Harry Potter (WWoHP) with that level of crowding. 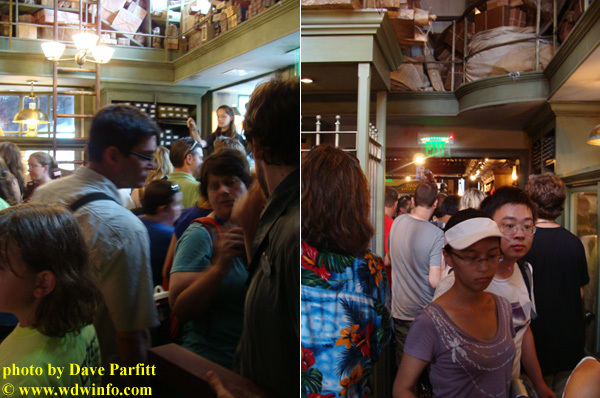 Image: Examples of crowding inside the buildings of the Wizarding World of Harry Potter. In some places crowds were so thick we could not move. 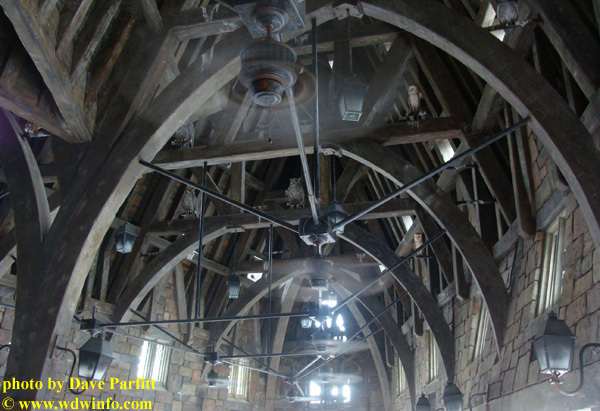 WWoHP was Universal’s flypaper and we were lured and trapped. The buildings and shops were so packed I questioned more than once their safety. One member of our family used a wheelchair for the day, and the shops were inaccessible due to tight aisles. Of the 3 attractions in the land, 2 were too intense for half the members of our family (1 adult and 1 child). Therefore, the small number of attractions ultimately left us feeling short-changed. For a full report of our day, please continue. WWoHP was THE part of the trip our girls anticipated most. 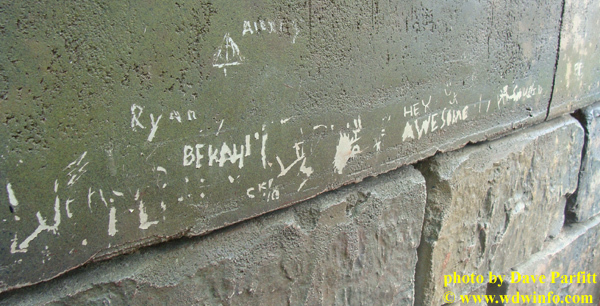 In their minds, this vacation was the “Harry Potter trip.” Monday, August 16th was Harry Potter day. 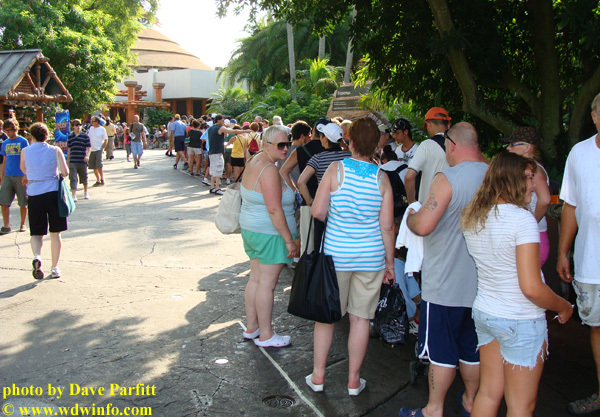 Upon entering Islands of Adventure at park opening (9 am), anyone wishing to go to WWoHP was directed to the left. We joined the Bataan Death March through Marvel Super Hero Island and Toon Lagoon before stopped in Jurassic Park. Get in line! Don’t get out! It will only get worse! barked the Universal Team Member. Ugh, we hoped because it was late summer, and near the start of the school year, maybe the crowds would be thinner. No such luck – long queues were the theme all day. Our first such wait began at 9:20 am. The wait to enter the land was not as bad as we feared. Within 30 minutes we passed through the gate into Hogsmeade Village, and made a beeline to the signature attraction Harry Potter and the Forbidden Journey. The wait time listed at 10:00 am was 60 minutes – not too bad for a headliner new attraction in a new land. Now, my wife has a mobility issue, and used a wheelchair for this trip. Therefore, we did not stop at the lockers (we kept our items on the chair), and entered the first portion of the queue. We were whisked through the catacombs of Hogwarts, and entered the outside portion of the queue. For as much as we’d heard the queue is part of this attraction, the outside portion was not that interesting. The spacing was barely wide enough for a wheelchair. 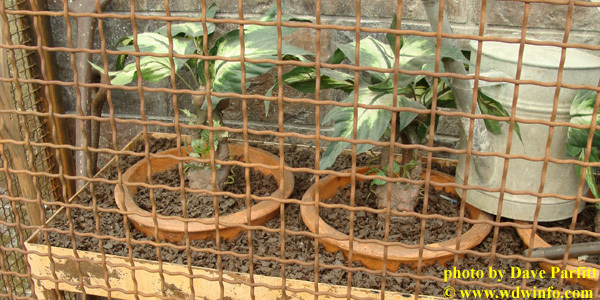 The crowd wound up and through the greenhouse, and viewed some mandrakes before entering the castle proper. This was the segment I was waiting for, the castle portion of the queue we had heard so much about. Once we entered the castle the crowd magically disappeared, but this was where I wanted to go slowly and absorb all the details and theming. Universal Team Members relentlessly instructed guests to move along quickly. We could not watch the “holographic” videos of Dumbledore in his office or Harry, Ron, and Hermione in the Defense Against the Dark Arts classroom. I’m glad we boarded the ride quicker, but we missed the entire “pre-show” that set up the ride. The ride was fun. Was it “ground-breaking” as Universal promoted? No, not really, it was much too similar to The Simpson’s Ride and The Amazing Adventures of Spider-Man. We enjoyed the ride to some extent, but Evie, our 9 year old, found it very intense and did not want to ride it again. My wife also had no desire to ride it again either and found it disorienting and uncomfortable. Keep this in mind, Harry Potter and the Forbidden Journey may be too intense for small children and those prone to motion sickness. After unloading from the ride, we gathered our wheelchair, and rode the elevator to the exit. 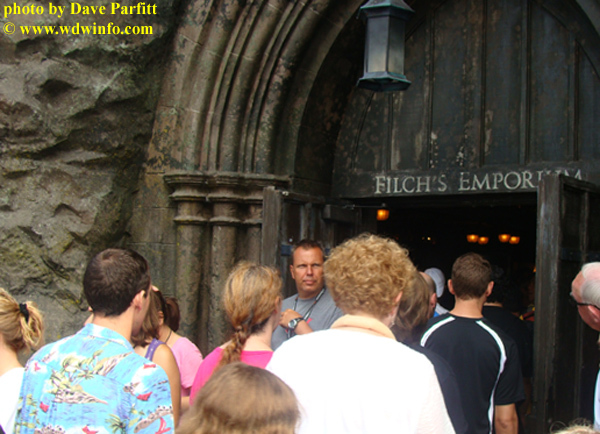 You are dumped into Filch’s Emporium gift shop, and it was here we fully realized the impact of the crowds. The exit design was poor at best and unsafe at the worst. Upon exiting, guests are faced with monitors with pictures taken during the ride. Everyone stopped to look for their picture – fine, not unexpected. However, at the same time, crowds are also forcing their way into the gift shop to shop. It was impossible and frustrating trying to negotiate the crowded space to exit – any joy from the ride was quickly erased by this experience. One could not push a wheelchair – scratch that, one could not walk – through an aisle if someone else stopped to look at the merchandise. We finally got out of the shop by physically moving a merchandise display rack in order to make the aisle bigger. The level of claustrophobia felt in this store was unreal, but minor compared to what was to come. 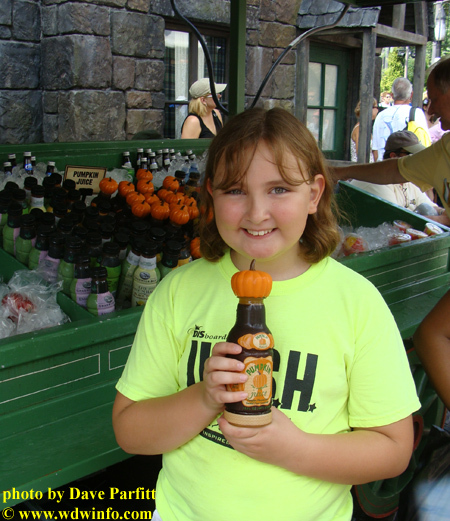 As we planned our WWoHP day, there were certain “must do’s.” Included on the list – sample pumpkin juice. We purchased two bottles. It was cold and sweet, like a liquified version of pumpkin pie. I enjoyed the mixture of spices in the juice, but others found it too sweet. One bottle was quite filling and went a long way. In fact, at the end of the day, we took one nearly full bottle back to our room to put in the fridge. We made our way to Flight of the Hippogriff, and it was a very enjoyable roller coaster – probably the highlight of the day. There was a short wait for the ride – maybe 15 minutes. The Hagrid theming that used the Giant’s voice and hut in the queue was extremely well done. You get fantastic views of Hogwarts castle from the line (particularly at night). 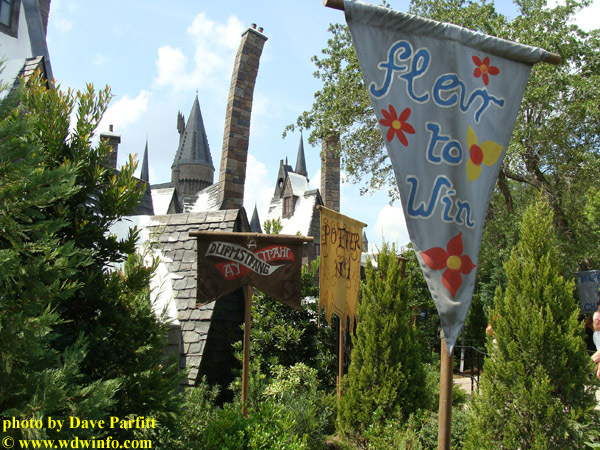 One we reached the loading area, the girls were thrilled to sit in the front seat of the “wicker” trainer hippogriff, and they bowed to the impressive Buckbeak animatronic as the trained inched up the first hill. 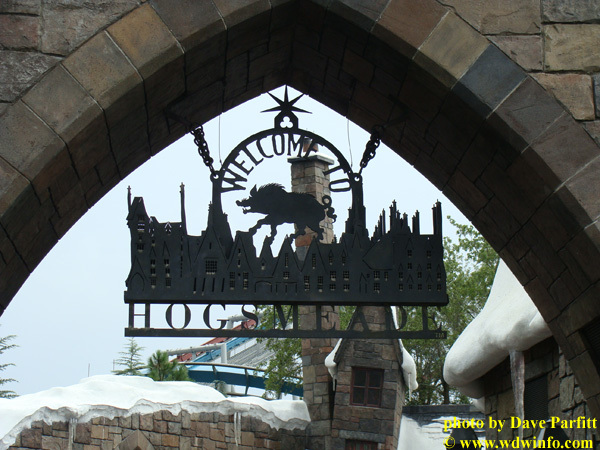 At the top of the hill there is an incredible view of Hogsmeade village spread out in front of you. In fact, you can even see Universal Studio’s Hollywood Rip Ride Rockit roller coaster in the distance. Then it was a quick, smooth, twisty ride back down to the station. Unfortunately, like a roller coaster, they day went downhill from this high point. 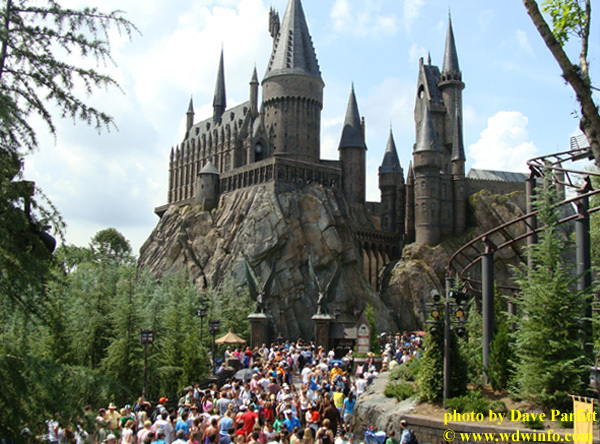 We exited Flight of the Hippogriff, and made our way down the hill to ride Dragon Challenge roller. I Thought That Was The Opening Act! 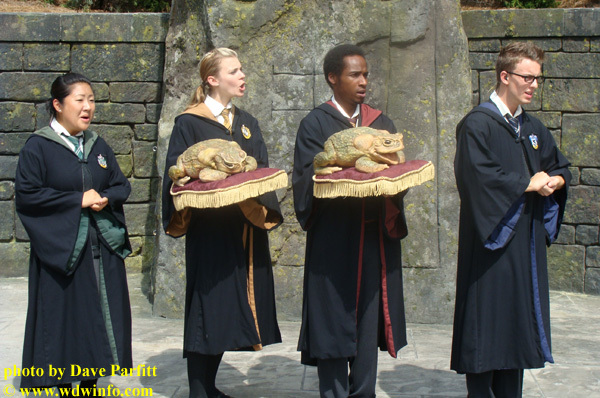 I need to step back for a second, before we rode the hippogriff coaster, the frog choir started singing, and we stopped to take in a song. A cute little show to be sure, but I was surprised to see it listed on the map as a featured attraction of the new land. 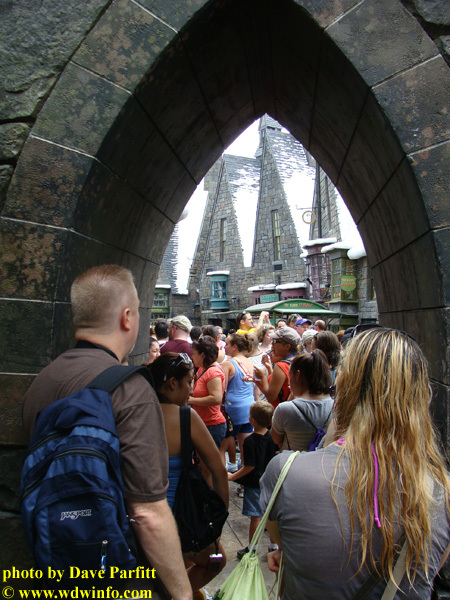 After we exited Flight of the Hippogriff, we noticed the participants of the Triwizard Spirit Rally entering the stage area. So, again, we decided to watch. Three “students” for Durmstrang displayed their combat skills. 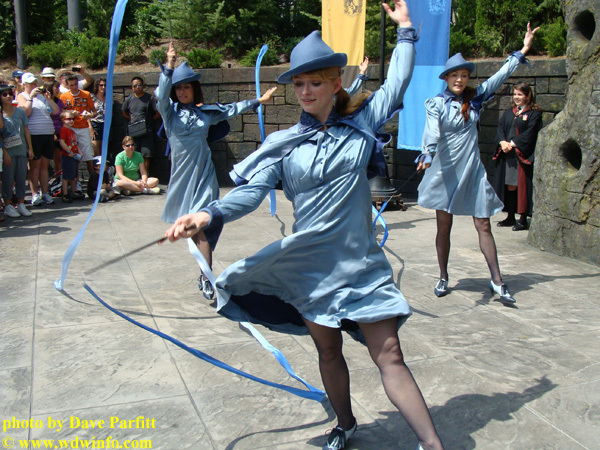 This was followed by the Beuxbatons co-eds mesmerizing the crowd with a graceful, twirling ribbon dance. Similar to the Frog Choir, the show was cute, but didn’t last for more than 5 minutes (I checked the time stamp on the photos). To list these performances as “shows” on the official Universal Orlando guide map was an overstatement. We considered them more along the lines of “streetmosphere” at a Disney theme park instead of full-blown shows. 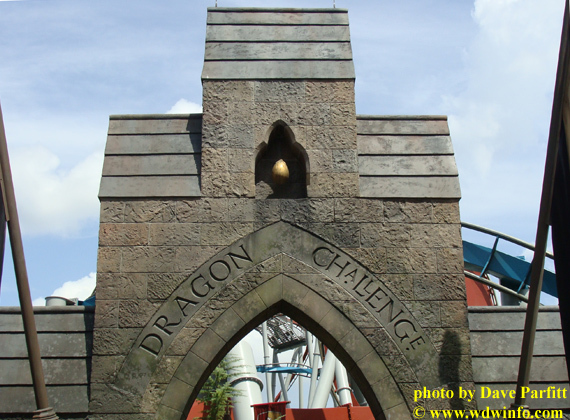 Spirit Rally ended, and we turned to go to Dragon Challenge. Wham! Stuck! We were against the flow of traffic, and could not walk. We waited, and eventually, forced our way through the crowd like salmon swimming upstream. Guests begrudgingly parted until we passed under the Dragon Challenge archway. Wait time was 10 minutes for the attraction. 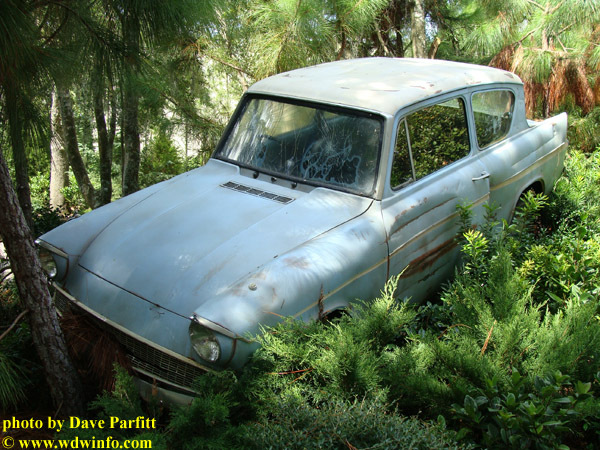 and Mr. Weasley’s Flying Ford Anglia (well, not flying anymore). Inside, one saw the golden eggs (goal of the Triwizard Tournament’s first challenge), the Goblet of Fire emitted a mysterious blue light, and the Triwizard Cup was also displayed. We walked straight to the loading area where half the family exited. Evie (age 9) and I selected the Chinese Fireball (red coaster), and quickly boarded the train. Great coaster! It’s fast, flips you upside down, and came awfully close to the Hungarian Horntail (blue train). It was amazing we just walked onto this coaster, but were thankful for the break from the stifling horde. It was noon. We experienced all the attractions in WWoHP (except for Ollivander’s Wand Shop) in slightly over 2 hours. OK, we had not shopped, did not eat in Three Broomsticks, nor drank butterbeer, but we had ridden all of the rides and saw the two listed “shows.” WWoHP was not an all day experience; it was not even a half day experience. 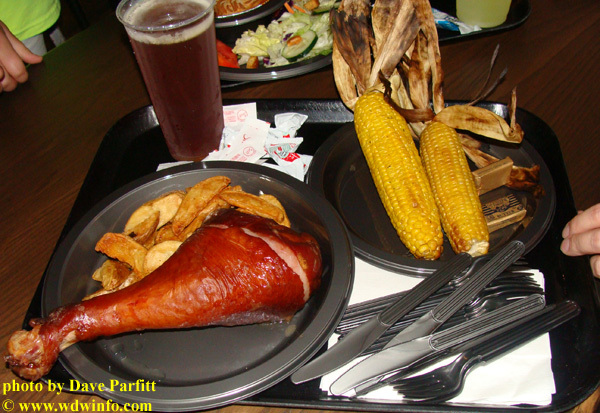 We were ready for lunch, but decided not to brave the noon crowd at Three Broomsticks. During our lunch in Seuss Landing’s Circus McGurkus Cafe Stoopendous it started to rain, and we hoped this would help thin out the crowds in WWoHP. We were wrong. Maggie bought us butterbeer while we waited. We purchased two glasses – one in a plastic souvenir mug. 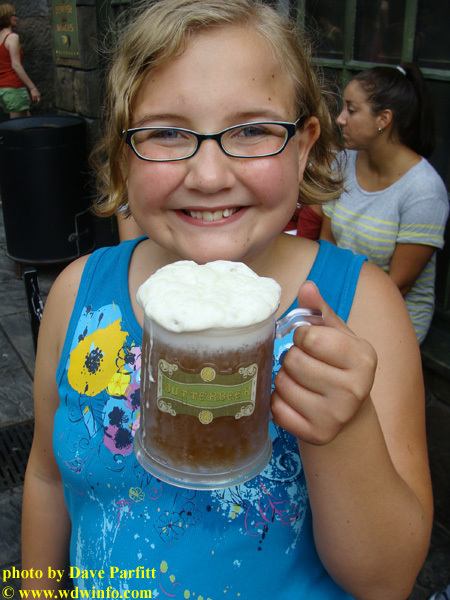 As with the pumpkin juice, butterbeer was a very sweet, filling drink. It was quite tasty, similar to a melted Werther’s butterscotch candy with a thick, rich head on it, but our family could have shared one glass and we would have been fine. A Universal Team Member placed near the end of the line answered the same questions over and over again, “How long is the wait?” and “What is this line for?” Look at the joy on all the guests’ faces. Finally, after two hours we made it to the entrance of Ollivander’s Wand Shop. Another team member who minded the door, asked a couple questions. How many were in our party? Did my wife need to sit in the wheelchair? Could she walk in and stand for the show? The number of guests allowed into the wand shop was controlled to insure an “intimate” experience. About 20-25 were let in at a time, we were one of the last to enter the shop, and by the time we were let in the Wand Master had already selected the children to participate in the show – 2 brothers were chosen. 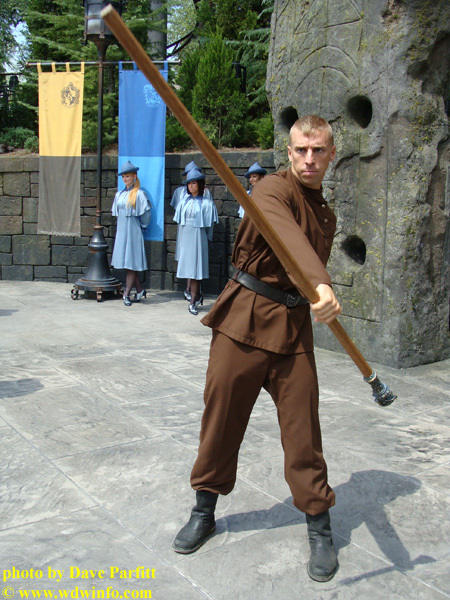 Once the “wand experience” ended, another team member opened the door to allow guests into the Owl Post to purchase their wands. He could not open the door from Ollivander’s into the Owl Post due to the crush of people on the other side to which he muttered, “This was a bad idea…” Remember the crowds I described in Filch’s Emporium? You could do pirouettes in the aisles compared to the Owl Post and the connected Dervish and Banges. My wife detested the claustrophobic conditions, and left to meet us outside. 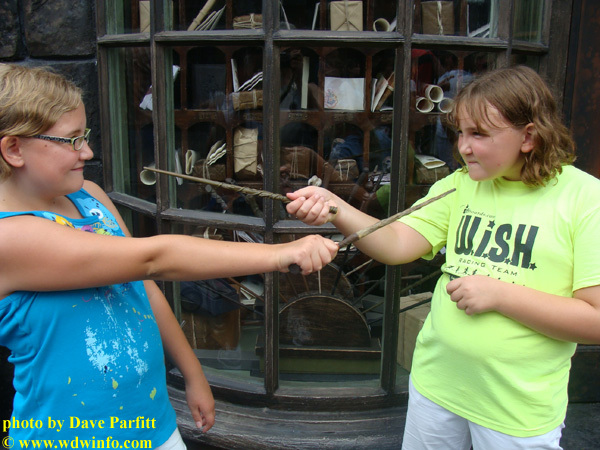 However, my girls were determined to select and purchase their wands. I used the picture below in the beginning of this article, but I thought it was worth showing again to illustrate the point. After we waited for Ollivander’s Wand Shop, and braved the crowds in the Owl Post and Dervish and Banges afterwards, I was spent and needed to find a quiet place to sit away from people. Unfortunately, there are few places to sit while in WWoHP. The Owlery beside Dervish and Banges contained many benches, but they were all taken. Eventually we found a table behind the Hog’s Head Pub. The rain started again, and we huddled under an umbrella above our outside table. I didn’t realize the water ran off the umbrella soaking my wife’s back. It was nearly 4:00 pm, and she was ready to leave. 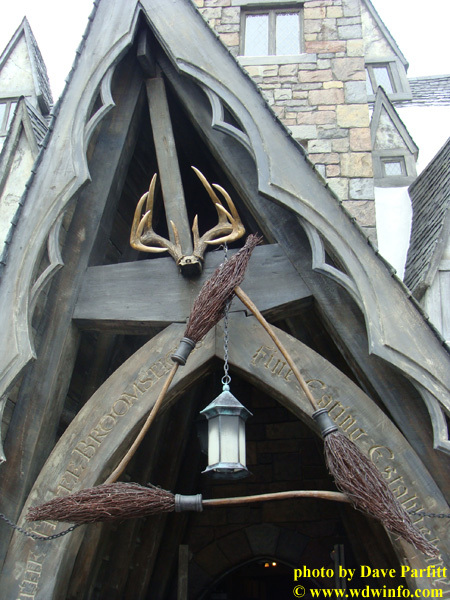 The only thing not crossed off the “must-do” list was eating in Three Broomsticks – Maggie desperately wanted to go there for dinner. I leaned over, and whispered to my wife, “Let’s sit here for a bit, rest, and then have an early dinner. That way we will have done everything the kids wanted to do and we don’t have to come back this vacation.” She agreed. 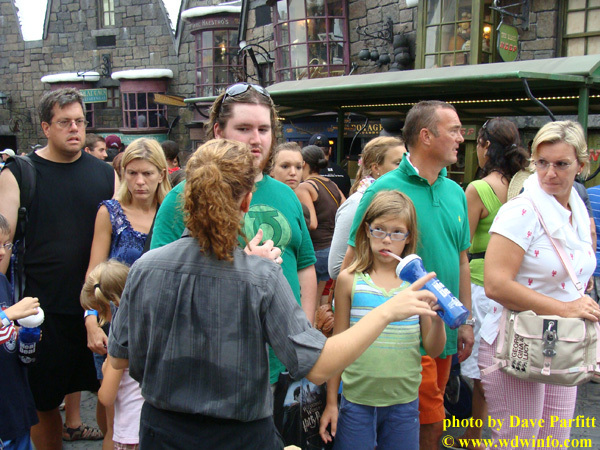 WWoHP had become something to endure rather than enjoy. We entered and were instructed to order our food, go through the line, and they would find a table for us. This system worked well. It was a pleasure to not have to search for a table, and to know we would have a place to sit. It was also nice to see food choices different than the typical burgers, fries, and pizza found in the rest of Islands of Adventure. 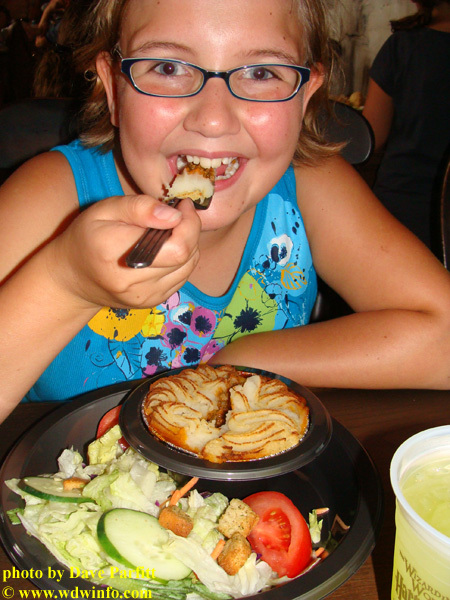 We chose some British standards such as Cornish pasties, shepherd’s pie, a turkey legs, and grilled corn on the cob. I also enjoyed a pint of the Hog’s Head Brew to wash down the grub and soothe my nerves. 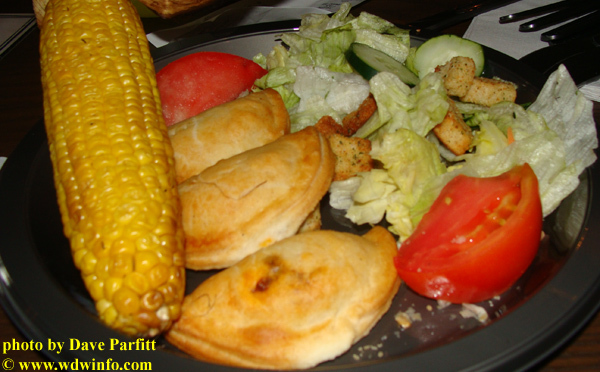 Cornish pasties with corn on the cob. Maggie enjoyed her shepherd’s pie. The food was fine for the most part. The only misstep was the turkey leg was so salty it was not edible. Evie even tried peeling the skin off the leg to see if that would help, but it was still too salty to eat. After our early dinner, our Wizarding World of Harry Potter experience was over. We did our parental duty, and indulged our children for this part of our vacation. Were there things we liked? Yes, we enjoyed the views and ride of Flight of the Hippogriff, and the pumpkin juice, butterbeer, and Three Broomsticks food wasn’t bad. However, our lasting impression of the day was the stifling horde. 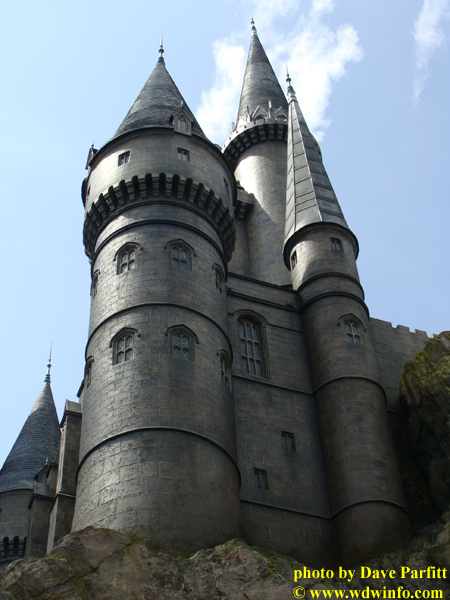 Wizarding World of Harry Potter would be an enjoyable couple of hours if it were larger, less crowded, and contained more attractions. However, as it exists now, we will not be heading back anytime soon. 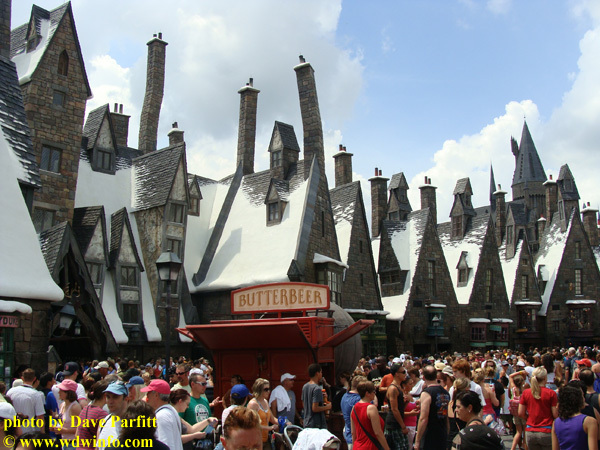 Have you gone to the Wizarding World of Harry Potter? What was your experience? Log in with your DISboards username and password to leave a comment below. Disclosure: As of December 2009, the Federal Trade Commission requires disclosure of any payments or considerations. Everything described in this article was paid for by David Parfitt and his family.